Le'Veon Bell has rushed for 528 yards and five touchdowns in nine games. 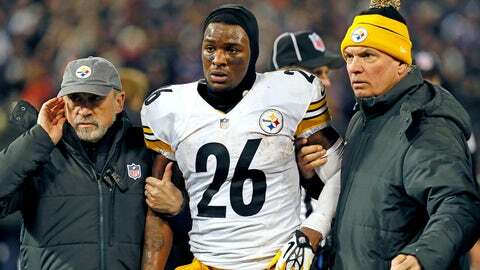 Steelers running back Le’Veon Bell said he couldn’t remember getting hit after sustaining a concussion in last Thursday’s 22-20 loss to the Ravens. Bell was cleared for full practice, the team announced Thursday. While Bell still needs to pass another exam to fulfill the league’s concussion protocol, it signals that he is progressing at a rapid rate. "I don’t remember the exact play," Bell said, via the Steelers’ official website earlier in the week. "I didn’t remember it when it first happened. Once I came off the field I didn’t really know I had scored. Then they told me I did; then they told me it wasn’t a touchdown. I wasn’t aware of what was going on at the time because I got hit. I can’t really remember what happened." Ravens cornerback Jimmy Smith laid a stifling blow to Bell and although the ball cross the plane of the end zone, it didn’t count because the running back’s helmet flew off. Per NFL rules, plays are blown dead immediately after a helmet comes off. Bell, who was selected in the second round in the 2013 NFL Draft, has been a workhorse for the Steelers this season. He’s carried the majority of the load, racking up 528 yards and 5 touchdowns in nine game. The Steelers host the Dolphins Sunday.